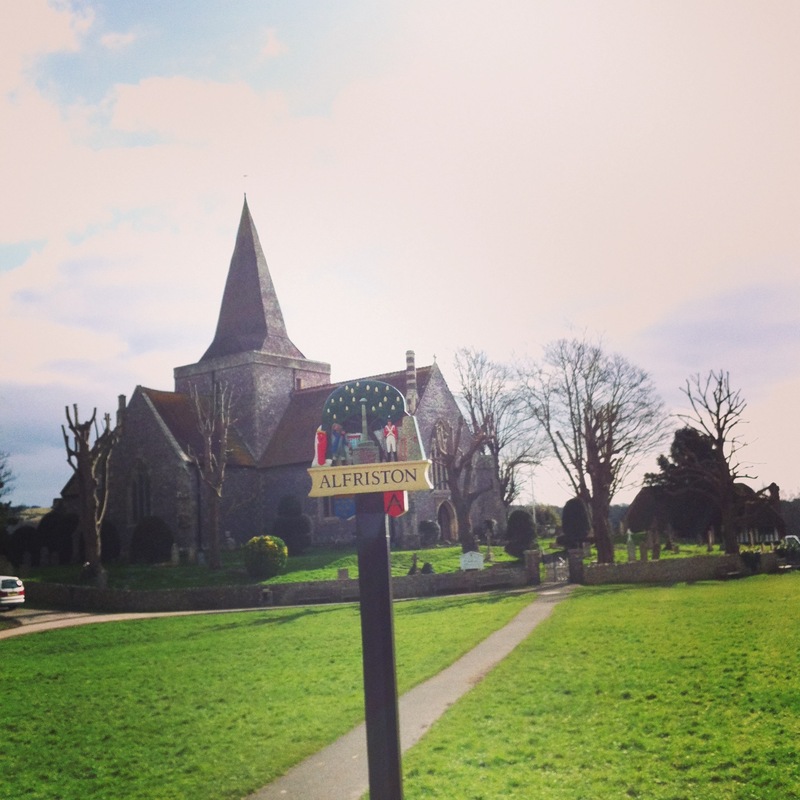 Today I decided to take a trip down to the south coast to a lovely village called Alfriston. Unfortunately this week it turns out the main road through the village was being dug up and the road was closed. Luckily for me the car park has been kept open so my 1 hr drive wasn’t in vain. 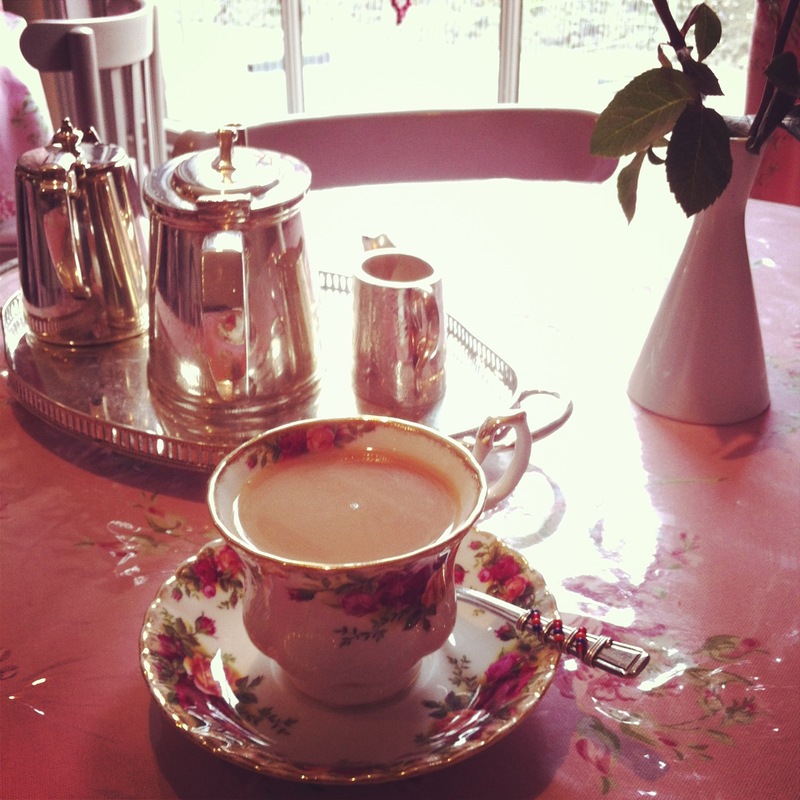 Due to the exceptionally cold weather I decided to head straight for a tea shop. Almost immediately I came upon Badgers at the old village bakery, cosy and warm with a lovely fire just perfect! I was pleased to see that they offer Molly cake, gluten free with no added fat sugar or eggs. The cake looked delicious but as it was too close to lunch time I settled for a nice cup of decaf tea. The tea was beautifully presented in a silver teapot and matching milk jug. The tea shop had a delicious looking array of homemade cakes, also a good choice of hot food. I asked the friendly waitress about gluten free food but was informed that they had little call so just offered molly cake. 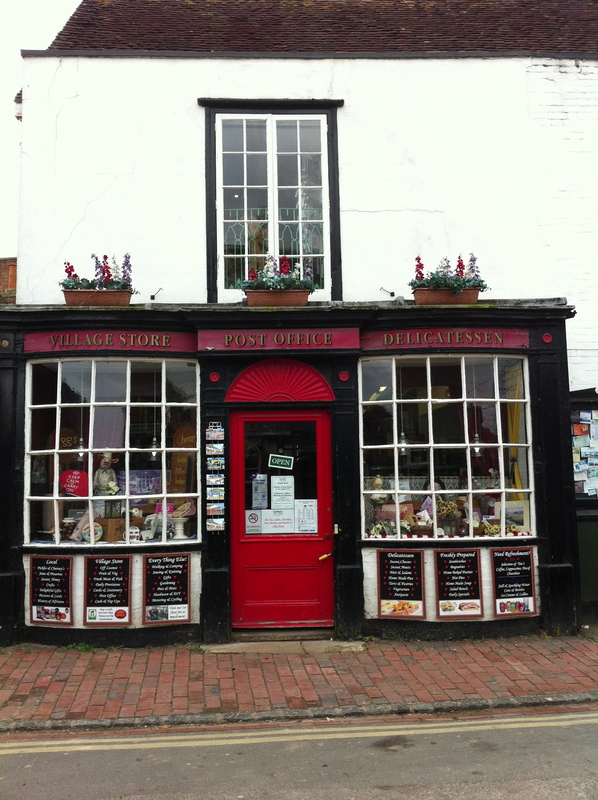 The village is a perfect place for a potter, there are some interesting gift shops and also a very old post office and shop containing a deli at the rear of the shop. well worth a look. Alfriston has a National trust property called The Clergy house which can be found just behind the high street near the church. It is a medieval thatched timber framed cottage. I have been to the village many times so didn’t pay a visit on this occasion. I had a walk around the village, having a good look at all the restaurant and cafe menu’s looking out for gluten free fayre. I settled on The singing kettle a tiny tea shop right in the centre of the village. I noticed that one of the specials was marked gluten free. 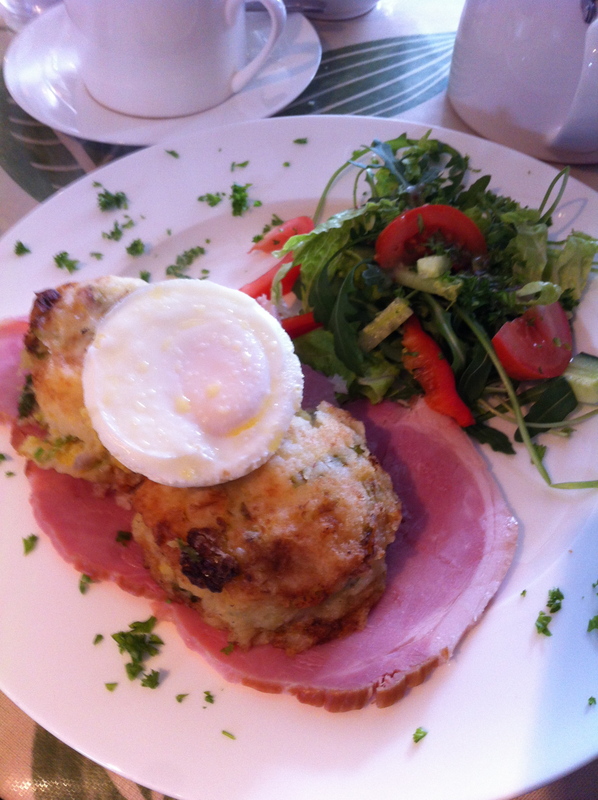 Bubble and squeak with free range poached egg and home cooked ham perfect on a day like today. Relieved to be out of the cold I chose a table by the fire. The waitress took my order and asked if I would like milk with my Camomile tea!? The hot food soon arrived decorated with a large quantity of parsley, It was nice to have something other than a baked potato. Usually my only choice being gluten and yeast free. I was very happy with my lunch, good quality ham and tasty bubble and squeak. Before I left to drive home I followed directions from the waitress to avoid the roadworks in the village and made my to my favourite lookout point at High and Over car park. From here you can see for miles. 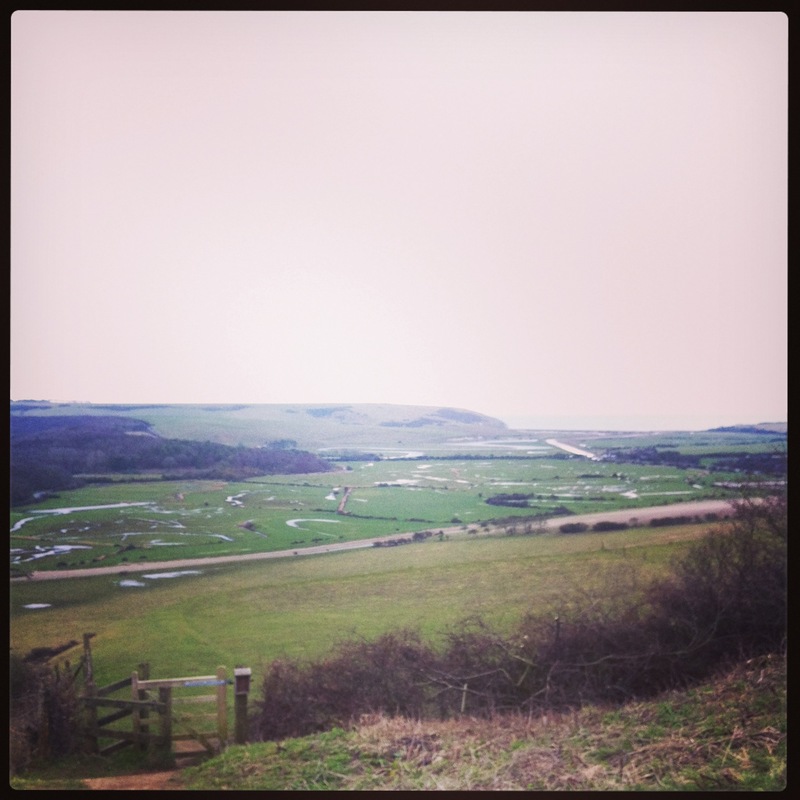 Below is the Cuckmere valley and the river winding down to the sea. In the distance you can see the sea and while I was there the sun pushed through the clouds for just a few moments and lit up the sea, stunning! By now I couldn’t feel my hands so hurriedly made my way back to the car. It was such a shame the weather had taken a turn for the worse because this area is amazing for long walks. Maybe next time I will take the dog and walk down to the beach at Cuckmere Haven and the Seven Sisters country park. Alfriston and surrounding area is well worth a visit. One of my very favourite places. I have many happy memories of time spent here. Great for a day out, and for the little ones Drusillas zoo park. I love Badger’s. In the summer we usually walk from Seaford or Bishopstone over the Downs and head to Alfriston to check out the tea shops.